[PDF] Most of time, you can generate an instant license key on our official website through our default payment method. Buyers will access a web page which asks for the Skype ID or PC Code to generate an unique license. But sometimes the web page doesn’t open or buyers close the web page by mistake, then we will need to generate license keys manually for buyers. Besides, we also provide other payment methods such as RegNow and Avangate. 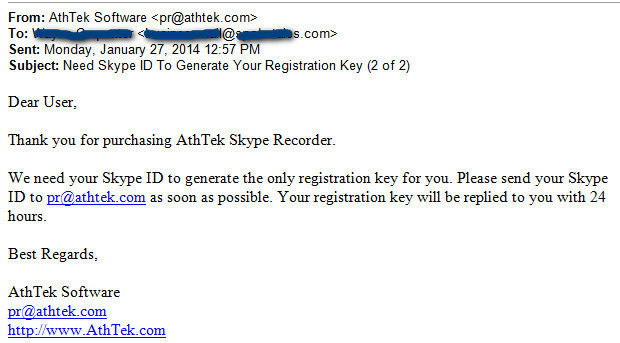 If a buyer buys AthTek Skype Recorder through RegNow or Avangate, he or she will have to provide Skype ID or PC Code to us to generate the license key manually. II. You bought AthTek Skype Recorder through RegNow. You will receive an email which asks you to reply your Skype ID or PC Code to us after payment. Please reply the email to us with the same content as above. We will generate a license key for you manually and send it to you as soon as we can. III. You bought AthTek Skype Recorder through Avangate. You would be asked to input your Skype ID if you wanted an ID-License, or the PC Code if you wanted a PC-License. If you input them both, we would generate an ID-License for you as default. If you didn’t input any, you would have to send an email to regsys@athtek.com with all the required information enclosed. We will generate a license key for you manually and send it to you as soon as we can. When you contact us through email, you’d better use the same email address with which you used in payment. Otherwise you should attach your transaction ID to the email. We cannot identify which order is yours without knowing your email address or transaction ID. So that please gets us known about that in your message for further troubleshooting. We will get back to you within 0-12 hours. You can also add AthTek to your Skype contacts list for a possible quick response.